Hot soups don’t normally come to mind during the summer months in Tucson, I’m more likely to make gazpacho or chłodink, but the beautiful selection of fresh corn on sale in all of the supermarkets got me thinking about chowders. I looked through several recipes online and ended up making this crab corn chowder by Rachael Ray. It’s always interesting to see the reaction you get when you mention Rachael Ray to people, as I did when I took this chowder to work for lunch. She obviously has legions of followers and is the much loved host of a multiple TV programs. I was surprised to hear some of my colleagues are among those who are put off by her persona of over the top enthusiastic, wholesome goodness. My brother, who lives, in New York City, shared some local society/gossip that sheds a different light on her life, but for myself, I’ve always felt that ever since Oprah discovered her, she was overexposed — something I guess she can worry about all the way to the bank. Enough gossipy chit- chat, back to the cooking. 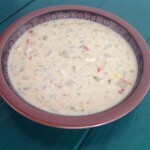 The crab corn chowder comes together quickly and is easy to make. You don’t have to have fresh corn, but I do recommend fresh crab rather than canned. You can find it sold in plastic cups in your better grocery stores, in Arizona that means AJ’s Fine Foods. 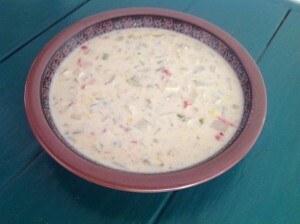 Crab corn chowder would be great topped with oyster crackers, croutons, or maybe a sprinkle of chives or green onions for a pop of color. If you make it, I’d love to hear what you think! 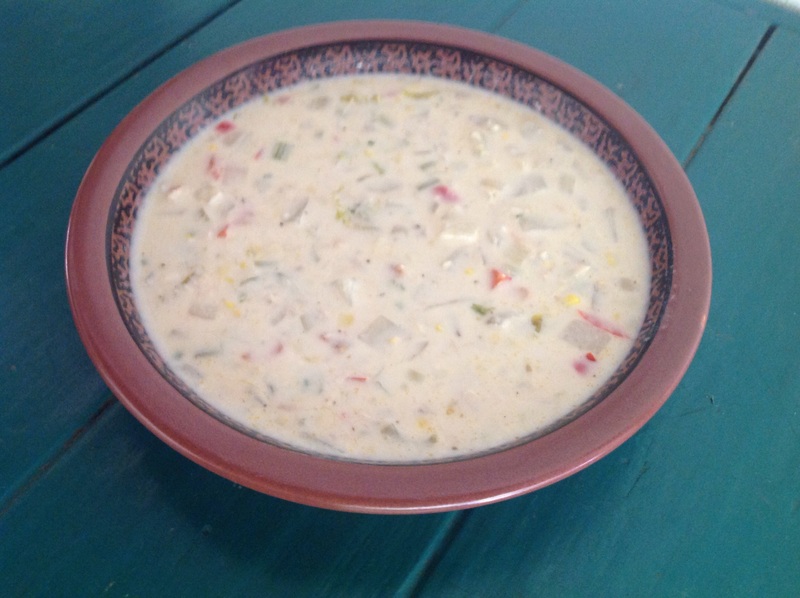 An easy to prepare, hearty seafood chowder, chocked full of yummy vegetables. Remove the bay leaf, and you’re ready to serve; smacznego! If you love the convenience of having a pot of soup, ready to go in the fridge, be sure to check out my Pinterest board, Year Round Soup Ideas. You’ll find a variety of hot and cold options from me and other soup loving pinners. Looks like a good corn soup will have to try it soon. Thanks. Looks fabulous! I always like clam chowder. I am sure this must taste better than clam chowder soup! I like clam chowder too, Faithy! They’re both good in my book! I’m definitely not a Rachael Ray fan, but that chowder sounds good. We make a lot of corn chowder in the summer, but next time I want to try this.